Sesame Street's producers are hoping fans who came to know and love Elmo's high-pitched giggles and overall goofiness will also love his newest buddy, a girl with autism—and that their friendship will foster acceptance of real kids with the disorder. Meet Julia. 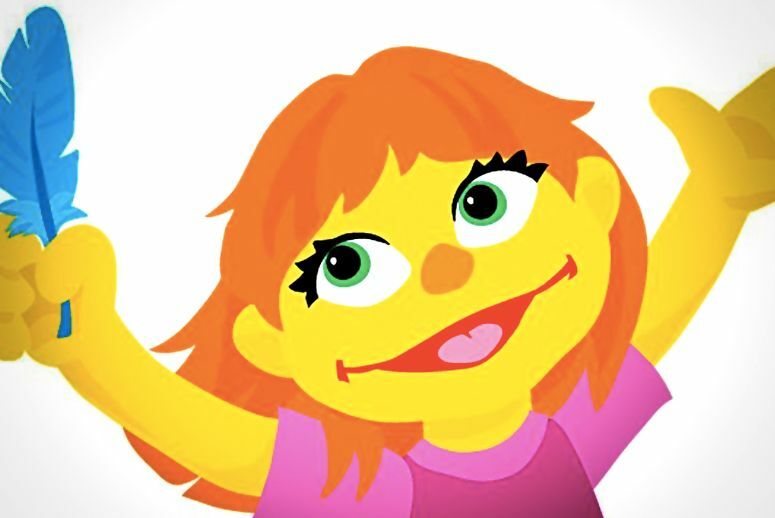 With her bright-orange hair and wide green eyes, Julia fits right in with the rest of the Muppets living in the fictional New York City borough. She has autism, but that doesn’t stop her from playing and having friends. Julia is part of the new initiative "Sesame Street and Autism: See Amazing in All Children," launched on Wednesday. Its website offers tips for children learning to play together, advice for parents of children with autism, and tips on how to talk and ask questions about autism. All of the content, including a catchy new tune called “The Amazing Song” and a digital storybook about Elmo and Julia’s first adventure, is free through the website. Instead of focusing on the differences between Elmo and Julia, the book highlights all that they have in common. Julia may have trouble making eye contact, dislike loud noises, and flap her arms when she’s excited, but she likes playing with blocks and on the swings just like Elmo. All the characteristics presented in Julia are common for a child on the autism spectrum, and in Julia’s case, she’s able to happily play with Elmo. However, many kids with autism don’t have understanding friends like Elmo. Approximately one in every 68 children born in the United States is on the autism spectrum, according to the Centers for Disease Control and Prevention. Children with autism are five times more likely to experience bullying than their peers, according to Sesame Workshop, the nonprofit behind the series. Roughly 12 percent of children with autism had never been invited to a birthday party, 6 percent were regularly picked last for teams, and 3 percent ate lunch alone every day, according to the National Autism Association. The executives at Sesame Workshop are hoping Julia and Elmo’s relationship can put a dent in bullying from an early age. 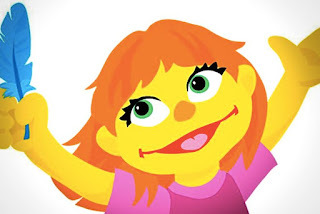 "When we explain from a child's point of view that there are certain behaviors, such as slapping their hands or making noises, to express excitement or unhappiness, it helps younger children to understand how to interact with their autistic peers,” Dr. Jeanette Betancourt, Sesame Workshop’s senior vice president of U.S. social impact, told People. “It makes children more comfortable and therefore more inclusive." Sesame Street has long been considered a gold standard in children’s television, teaching kids their ABCs and 1, 2, 3s on a daily basis. Watching the public access education show can help children succeed in school, according to a study released this summer by Wellesley College and the University of Maryland. With the addition of Julia, the executives over at Sesame Workshop are hoping to foster academic and emotional intelligence in their rapt audience. 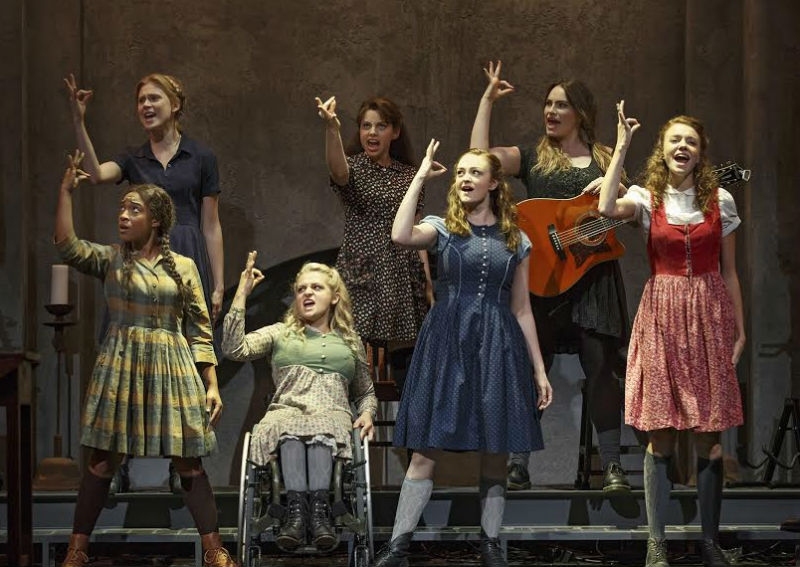 There’s nothing on Broadway like Deaf West Theater’s Spring Awakening. The production is accessible to both the hearing and Deaf communities and it plays out so beautiful that you start to wonder why it has taken so long for a production with that translation to reach the big stage. Director Michael Aren and the rest of the creative team ensured that every moment in the musical was bilingual. Not every person on stage speaks and not all sign, but with a few theatrical devices well used the entire audience was on the same page. The story in Spring Awakening takes place in Berlin 1891 while the score and costumes of the on-stage musical ensemble are inspired by rock and punk. Two characters were paired with musicians from the band who play their voice. Wendla, played by Sandra Mae Frank, was paired with guitarist Katie Boeck and Moritz, played by Daniel N. Durant, was paired with Alex Boniello. Each couple had a touching symbiosis that highlighted the character’s loneliness and isolation. They were completely attuned and synched in body and voice, so by the end of the show I almost forgot that Wendla never spoke out loud. Even better, because the people who played the voices were also in the band this brought the music to life in a different, visceral way than you’ll usually feel during musical theater. The rest of the cast signed or spoke to and for each other. Cleverly placed projections by Lucy Mackinnon filled in the rest of the interpretations. While the intersection of the hearing and the Deaf wasn’t the crux of the story, which investigates the fates of 13-year-olds whose discovery of sexuality leads to their downfall, the interplay heightened the circumstances. These kids, wronged by what lead Melchior, played by Austin P. McKenzie, called the “parentocracy” were clinging on onto each other as the unforgiving world decided their fates for them. There is ample space for productions accessible to the Deaf community to be successful on Broadway. It only takes a bit of imagination to get them there. The program committee of the 29th annual meeting of the Society for Disability Studies invites you to consider the multiple and significant possibilities at the intersections of disability, media, education, and public policy. 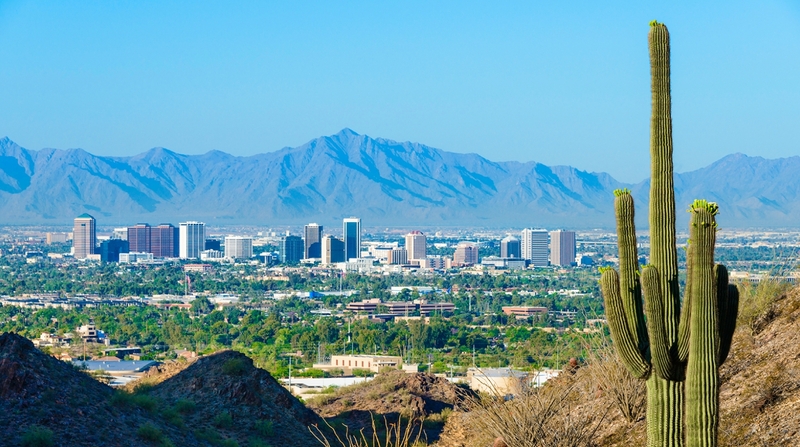 As Arizona’s fraught political history reminds us, the public sphere can be a vibrant space filled not only with contestation and conflicting ideas and agendas, but also with camaraderie and interdependence. Please join us in Phoenix and make your voice heard. Disability in most societies has left the shadows to become a visible part of the larger culture. Through news and entertainment media, through changing public policies, through attention in teaching at all levels, focus on disability is becoming more vibrant. These public areas help shape meanings and representations of disability, and disability in turn shapes the public sphere. Disability presents in the public sphere in many ways that intersect with Disability Studies research. What is being (or not being) taught about disability at all grade levels and in higher education? How are disability rights reflected (or not reflected) in public policies? What are the varied mediated representations of disability in a society? How do those mediated representations affect the lived experiences of people with disabilities? How are people with disabilities able to (or not able to) access public activities and forums of various kinds? Communities, activists, artists, advocates and allies - local, national, international – are encouraged to participate in the SDS conference. We strongly encourage full panel submissions, including 3-4 presenters with a designated moderator/discussant. Individual paper submissions are welcomed as well. We welcome proposals in all areas of disability studies, but especially those submissions premised on this year's theme. The deadline for proposals is December 1, 2015. Participants MAY NOT appear in more than ONE major role (peer-reviewed presentation), excluding evening performances, non-presenting organizer, non-presenting moderator, New Book/Work Reception. Conference participants submitting more than one proposal must rank-order their preferences for participation. The program committee will prioritize spreading program slots across the membership before offering multiple slots to any one participant. If you intend to participate in multiple events, please complete the submission process for each event. This year’s program committee is continuing the idea of specific “strands” that relate to the larger more general theme of the SDS conference. Each strand may have 3 or 4 related events (e.g. panels, workshops), organized to occur throughout the conference in a way that will eliminate any overlap of sessions. With an emphasis on disability and native peoples, First Nations, aboriginal peoples, and American Indians, these papers and sessions explore challenges and possibilities that shape collaboration, culture, and community. How are relations negotiated within intersecting identities, cultures, and disabilities? What are the terms of community self-definition? How do identities, intersectional locations, and/or community definitions become codified in policy and law? Papers and sessions that explore object studies, architecture, sustainability, design in professional contexts, military tech, material culture, robotics, etc. How do we think about personhood, life, humanness, and the ways that mobility devices, prosthetics, and wheelchairs can be experienced as integral to living bodies? In what ways does media influence our interactions with and understandings of various technologies? How do gender, race, class, sexuality, and living location affect access to and experiences with disability technologies? SDS recognizes Arizona’s troubled relationship with immigrants and other minoritized communities. This strand seeks to encourage constructive dialogue that engages with intersecting state oppressions at all levels that affect people with disabilities and all of their allies in the fight for civil and human rights. How do various disability organizations (including SDS) carry out, contest, complicate, and contextualize power and privilege? Papers and sessions that explore professional matters such as locating funding, pursuing academic and non-academic jobs, managing non-tenured careers, networking, surviving the tenure track, etc. How does the changing and developing “institutionality” of disability studies impact professional development and the way they get represented in the public sphere? Translational research refers to research that translates between disciplines, and from basic research to applied research and to practice, the goals of this strand are: (1) to demonstrate how disability studies theory contributes to the conception of health sciences research and practice; (2) to provide best practice examples of disability studies translational research and practice; and (3) to mentor a new generation of federally funded disability studies researchers and practitioners. We particularly welcome submissions from clinicians/clinical researchers close to disability (whether disabled or not) who are interested in cutting edge disability studies perspectives. Historical presentations from a variety of research perspectives that explore the history of disability and disabled people in the public sphere. If you would like your proposal to be considered as part of one of these thematic strands, please note the strand in your submission information. Other strands may emerge from member proposals as we receive them. These will NOT be available for the Phoenix 2016 conference. The accessibility and infrastructure is not available to us given the location as well as the predicted size and scope of this year’s conference. · Groups of 3-4 presenters (each with 15-20 minutes) and a designated organizer / contact person and moderator (need not be the same person), plus an optional discussant, are encouraged to submit proposals around a central topic, theme, or approach. Panel proposals require BOTH a 300-word proposal describing the panel AND a 300-word abstract for each paper/presentation. List all paper/presentation co-authors, identify the presenting author(s), and provide credentials for the discussant, if one is planned. Individual presentations will be placed alongside two or three other panelists with a similar topic and a moderator chosen by the Program Committee. In general, we assume 15-20-minute presentations (if you are requesting more time, please specify and explain why). Presenters are required to submit 300-word abstracts for individual papers/presentations. List all co-authors, if any, and designate the presenting author(s). A topical discussion with a designated organizer / contact person and moderator (need not be the same person), but with only short (5-7 min.) presentations to start discussion, if any. Submit a 500-word proposal, including a description of how the time will be used, complete contact information for the designated organizer and each participant in the discussion, and a description of their roles. Engaged application of a specific program or exercise involving a minimum of 4 planners / presenters. Proposals should include a 500-word proposal that addresses methodology and anticipated learning outcomes. Proposals must describe the format of the workshop. How will you use the time? Please describe the credentials and role of each workshop participant, designate a contact person/moderator, and provide complete contact information for each planner / presenter. Individuals or small teams will be provided a common space and time with an easel (and/or table if requested) to present a display of a research, training, service, or advocacy project, or other work. Presenters should be in attendance at the poster session. Submissions for the poster session require a 300-word abstract, complete contact information for anyone involved in the project who will attend SDS, and a designated lead contact person. Each year, SDS proudly awards the Tanis Doe Award for the best poster. We encourage submissions of a creative/artistic event in any media by individuals and/or groups. All proposals should clearly list at least one person who will register for and attend the conference as the event presenter/host. Submissions must include a 500-word proposal, and sample of the proposed work (up to 2,500 words of text, ten images of artistic work, demo CD, YouTube or other Internet link, DVD, or other appropriate format). Send via email at SDSCONF2016@GMAIL.COM or postal mail to the SDS Executive Office at: Society for Disability Studies/ 538 Park Hall – History Dept / University at Buffalo / Buffalo, NY 14260-4130 / USA. Submissions must reach the SDS Executive Office by the submission deadline. Please describe the background and role of each artist/participant and designate a contact person / moderator. Performers should be aware that SDS does not have the ability to provide theatrical and or stage settings. While every effort will be made to provide appropriate performance spaces, proposing performers are advised that special lighting, audiovisual equipment, and staging requests cannot be accommodated. Ideally, film submissions do not exceed 60 minutes in length in order to allow for commentary and discussion. All film entries accepted for presentation at the 2016 Conference must be provided to the SDS Executive Office on DVD not less than 30 days prior to the start of the Conference in open-captioned format, and the film’s sponsor should be prepared to provide audio description as needed. As SDS cannot pay distribution rights for film screenings, the film’s sponsor is fully responsible for securing any necessary permissions from trade and copyright holders for public screening. Sponsors of accepted films must register for and attend the conference, host the screening, bring documentation of rights clearance to the Conference and make it available during the film screening. SDS may request the right to schedule more than one screening at the conference. SDS program committee may request more samples and cannot return materials that are submitted for consideration. Films and film clips may also be submitted as part of format categories A-F as described above and are subject to the same accessibility requirements as full-length film proposals. Various ad hoc and organized SDS or other non-profit groups may wish to have business, organizational, or informational meetings or some other kind of non-peer-reviewed event or exhibit space at the meetings. Anyone hoping to host any such event should request space by December 1, 2015 by using the proposal submission form. After December 1, space will be allocated on a first-come, first-served basis. No meetings can be planned through SDS after the early-bird deadline of May 1, 2016. All presenters at such events must register for the conference. Requests from groups not affiliated with SDS may be assessed a share of cost for space and access arrangements. Please provide the name of group, a description of the group and/or meeting purpose and format (in 300 words), and contact information for at least one organizer and a designated moderator. SDS will provide ASL/CART as needed. Organizers should contact SDS to request catering or any other special arrangements. Most of these meetings will take place in designated time blocks; be aware then that a proposed SIG or Caucus or Meeting will be scheduled against many others. All participants must register and pay for the conference through the SDS website (http://disstudies.org/) or the Executive Office by the early bird deadline: May 1, 2016, or they will be removed from the program. Early bird registration will begin Monday, March 7, 2016. Participants will be notified of the status of their proposal and their paneling/place by Feb. 19, 2016. Any cancellations and requests for refunds after May 1, 2016 (the early bird deadline) may incur a cancellation fee. Any participant unable to attend must notify SDS in a timely fashion. Please note: low income/student/international member presenters are eligible for modest financial aid for meeting costs. Applications for financial assistance will be available via the SDS listserv in the coming months. Any participant with a book or other materials (e.g., DVD, CD) finished within the last three years (2013, 2014, 2015) is welcome to participate in the New Book/Work Reception. At least one person must register and be in attendance to host the reception display. You will be provided a table for display and the opportunity to interact with conference participants. The fee for representation in the New Book/Work Reception is $45.00. You will have the opportunity to register as an author attending the New Book Reception when you register for the conference. Please indicate on the submission form whether you are willing to serve as moderator for a session. In keeping with the philosophy of SDS, we ask that presenters attend carefully to the accessibility of their presentations. 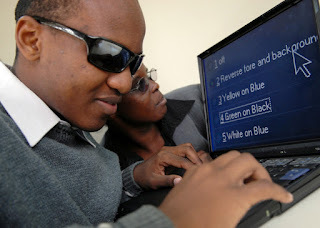 As a prospective presenter, you agree to follow the SDS Guidelines for accessible presentations found here: http://www.disstudies.org/conferences/accessible-presentations. Non-dedicated, WIFI Internet access (i.e. not functional for audio/video download reliably) Do NOT depend on WIFI access. Have a back-up. SDS does not provide computers, overhead projectors, or other audio/visual equipment as a matter of course. Presenters are responsible for ensuring that presentation structure and planning works well within these audio/visual parameters. *This information may not be applicable to film showings and some other events. SUBMISSION AGREEMENT: PLEASE READ CAREFULLY. YOU ARE AGREEING TO ALL OF THESE CLAUSES. By submitting to SDS 2016 in Phoenix, you give SDS permission to publish your abstracts, photograph you, publish such photographs on the SDS web site or other publications, audio or video record your presentation, transcribe the presentation for access needs, and transmit or post and archive such recordings and transcriptions via live-streaming, podcast form, or any other electronic means. If submitting on behalf of multiple presenters and authors, you certify that each presenter and author has granted his/her permission to Society for Disability Studies for purposes described in this paragraph. By giving this permission, you understand that you retain full rights to your work but give SDS the right to use your presentation in the context of the 2016 conference, including (but not limited to) charging attendees and others for access to derivative audio or video products, recordings or podcasts. Anxious parents of high school athletes keep calling the Connecticut headquarters of the Eastern College Athletic Conference. They want to know: Will my daughter be able to play for a league title in wheelchair basketball? Will my son be able to compete in sled hockey as a varsity athlete? What about sitting volleyball, wheelchair rugby, and goalball? The ECAC’s answer: Yes, yes, yes. This fall, the ECAC becomes the first collegiate athletic conference to offer NCAA-sanctioned events and varsity-level competition in adaptive sports. During the current school year, the ECAC expects athletes with disabilities to vie for championships in swimming, track and field, and wheelchair basketball. In the near future, the conference plans to add championships in sled hockey, goalball (a team sport for the visually impaired, using a ball with bells in it), sitting volleyball, rowing, and tennis. Five years from now, ECAC leaders hope, roughly 1,000 athletes with disabilities will be competing in several sports. “For athletes, it means the opportunity to play for their school,” said Joe Walsh, president of Adaptive Sports New England, a Massachusetts nonprofit organization that aims to increase sports participation for children and young adults with visual or mobility impairments. “They identify themselves as athletes. That’s part of who they are. Previously, if wheelchair basketball players wanted to play in college, they were limited to schools that offered essentially club programs, such as the universities of Illinois, Alabama, and Wisconsin-Whitewater. “What it means is our student-athletes are valued and recognized on the same level as their able-bodied peers on campus as varsity athletes, and that’s never happened before in wheelchair basketball,” said Stephanie Wheeler, head coach of USA Women’s Wheelchair Basketball and of women’s wheelchair basketball at Illinois. Participants in other adaptive sports faced similarly limited options. Generally, they could play at the club level at a handful of schools, attend a college that serves as a Paralympic training site, or earn a spot on a team with all able-bodied athletes. Since adaptive sports teams typically fall outside athletic department oversight and often involve a mix of college students and community members, it’s difficult to pin down exactly what opportunities exist and where. “They see how they are not equal to the other athletes on our campus,” said Wheeler. “They notice it in facilities, in access to the complete educational and athletic experience that other students are receiving on our campus. “They see that they’re not experiencing college in the same way that those student-athletes are. The ECAC model will place an emphasis on inclusion. And that will be achieved in different ways for different sports. For swimming and track and field, adaptive athletes will join existing teams. 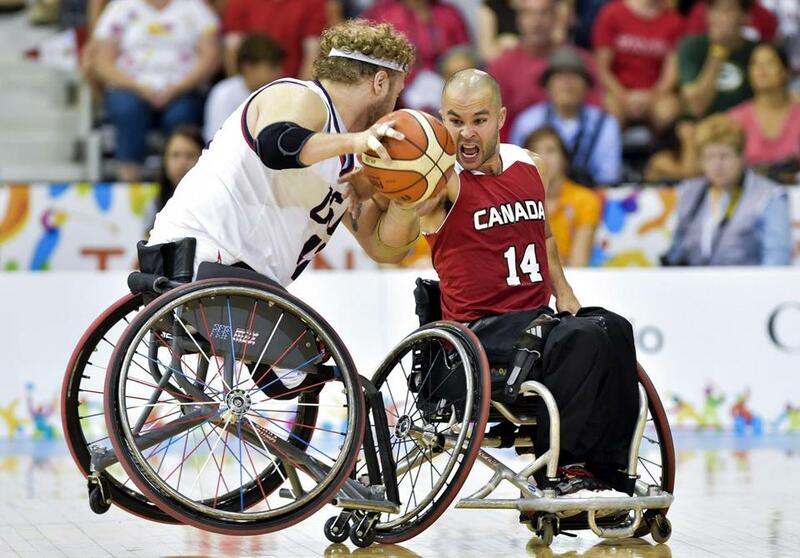 In wheelchair basketball, roster spots will be open to wheelchair-dependent athletes as well as able-bodied players who compete in wheelchairs. The same mix of participants will be eligible for other adaptive team sports such as sled hockey, sitting volleyball, and goalball. To explain how that mix will work, adaptive sports advocate Ted Fay references a Guinness beer commercial that features a pickup wheelchair basketball game. Of the six players shown, only one uses a wheelchair off the court. To preserve opportunities for wheelchair-dependent athletes, the ECAC is proposing that league rules allow up to two able-bodied athletes per team on the court at one time. “The ‘normal’ basketball that society knows is stand and play, run and play, jump and play,” said Fay, a sport management professor at SUNY-Cortland and ECAC senior adviser on Inclusive Sport. “We’re saying there’s another basketball discipline, wheelchair basketball, where you sit and play. 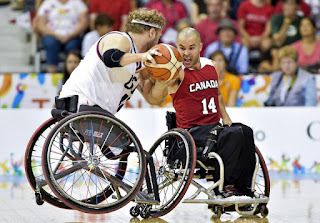 “You need to be well-trained for wheelchair basketball. You need to learn how to manipulate a chair, and shoot and dribble from a sitting position. Another aspect of the ECAC’s vision is that adaptive competitions will count in team scoring. So swimmers, track and field competitors, and other athletes with disabilities will participate in events that can add to their school’s point totals at major meets. The ECAC is the nation’s largest athletic conference, consisting of 300-plus member schools spread across 16 states and multiple divisions, including more than 90 in New England and more than 45 in Massachusetts. Boston College, Boston University, Harvard, Northeastern, MIT, Merrimack, and Tufts are among the schools that compete in the ECAC. They take advantage of a league structure in which member schools can selectively enter teams in the conference’s competitions. For example, a member school can participate in the ECAC in wheelchair basketball and Division 3 women’s ice hockey, but place other teams in other leagues and other divisions. Advocates such as Fay hope that kind of flexibility will encourage schools to add adaptive sports. The ECAC decided to start with swimming, track and field, and wheelchair basketball partly because those sports don’t require a lot of additional resources. With swimming and track and field, it will be likely a matter of simply adding a few athletes to existing teams. The adaptive events proposed for track and field include shot put, discus, long jump, and the 100-, 400-, 800-, and 1,500-meter races. In swimming, the proposed events are the 50- and 100-yard freestyles, the 100-yard backstroke, and the 200-yard individual medley. Eight ECAC schools already play men’s wheelchair basketball and four play women’s wheelchair basketball at a club level. So the wheelchair basketball competition will start with officially designating those teams as varsity programs and forming an ECAC league. The ECAC and its advisers are still calculating costs. They will vary from school to school, depending on what the institution already has in place and what it plans to offer. According to Fay, the biggest new expenses will likely be accessible transportation and adaptive equipment. At the moment, however, the biggest challenge for both ECAC leaders and adaptive sports advocates isn’t financial. It’s finding athletes. Most adaptive sports don’t have systems in place for identifying athletes, making it difficult for schools to determine whether they have potential varsity candidates already on campus. Additionally, schools need to figure out the best ways to recruit potential adaptive athletes locally, nationally, and internationally. Gary Caldwell, director of rowing for Tufts and commissioner of the Intercollegiate Rowing Association, believes a partnership with Brighton-based Community Rowing could help identify local talent in his sport. (Community Rowing is known for its well-established Para Rowing program.) And Caldwell is considering other ways of finding athletes such as talking with makers of prostheses. Still, it will take years to establish NCAA-sanctioned adaptive sports and the pipelines of talent to feed them. “In our little corner of the college world, in rowing, we’re willing to throw stuff up on the wall and see what sticks,” said Caldwell. From The Los Angeles Times. In the picture, Compton Unified student Kimberly Cervantes, center, photographed in May 2015, is part of a lawsuit seeking disability protections for students suffering from the effects of trauma. Behind her are attorney Annie Hudson-Price, left, and attorney Kathryn Eidmann. Students who have experienced trauma could be eligible for some of the same protections as students with disabilities based on the effects of that trauma, according to a ruling by a federal judge September 29. But the degrees, types and effects of trauma that would trigger such protections have yet to be determined. The procedural rulings from Judge Michael W. Fitzgerald came in response to a lawsuit filed on behalf of five students and three teachers in the Compton Unified School District that aimed to establish “complex trauma” as a type of disability under the Americans with Disabilities Act and Section 504 of the Rehabilitation Act. Representing the plaintiffs, Los Angeles-based pro bono firm Public Counsel presented the judge with research showing that exposure to trauma can hurt a student’s ability to learn, much in the same way as other impairments. Huff, an attorney at Orbach Huff Suarez & Henderson, confirmed in an interview that the district is conducting trauma training on Oct. 13, similar to the trainings it has already held. Public Counsel attorney Mark Rosenbaum interpreted the injunction loss as a temporary setback — he said he is confident he will be able to satisfy the court’s burden of proof that there was sufficient trauma among the students he represents. Fitzgerald wrote that the suit survives on the grounds that trauma could be a disability, but “complex trauma" as defined by the original suit as “exposure to two or more traumatic events” is not endorsed by the court. That ruling, Rosenbaum said, is precedent setting, because the court recognized that complex trauma "is a disability … under the law.”Fitzgerald wrote that “Plaintiffs have adequately alleged, at least, that complex trauma can result in neurobiological effects constituting a physical impairment for purposes” of disability law. But Rosenbaum acknowledged that he needs to better define what constitutes such impairment. Huff says Compton interprets the ruling differently. "The court says it is not making a final decision as to how it will be resolved and does not make a decision as to how any student actually suffers trauma," he said. "Just because a child growing up in Compton has suffered an adverse childhood experience ... does not mean he or she is disabled under federal law. There has to be more of a nexus there." Huff said the district plans to continue fighting the suit. Eidmann says Public Counsel agrees that the exposure to two or more traumatic events is an insufficient bar for receiving some disability protections. "Young people may respond to traumatic experiences in many ways and not experience impairment in functioning as a result," she said in an email. "Exposure to trauma can create neurobiological effects in the brains and bodies of young people, and these effects meet the definition of disability under the ADA. In other words, it is the physiological effects that many people experience after enduring trauma, and not the adverse experiences themselves, that constitutes the disability." Denise Marshall, executive director of the Council of Parent Attorneys and Advocates, a national disability group, thinks the procedural ruling represents a step forward for her constituency. As Marshall noted, the rulings come as the issue of trauma training is already on her mind this week. On Wednesday, U.S. Secretary of Education Arne Duncan said he wanted to "put a new emphasis on schools rather than jails" by cutting in half the number of people incarcerated for nonviolent crimes, saving $15 billion a year, and increasing teachers' salaries with the money. To make that happen, COPAA called for increasing behavioral interventions and trauma-sensitivity trainings.